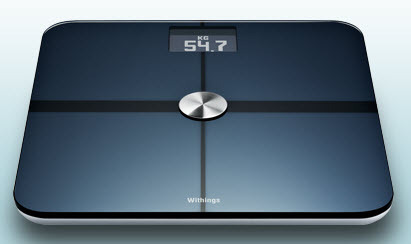 The Connected bathroom scale is a new, high tech gadget from Withings. It provides a way of measuring your weight and keeping track of your diet progress and body composition that is in keeping with the modern focus on persona fitness. The basic concept is this: the bathroom scales tell you your weight in the normal manner and then using a WiFi connection, the results are sent to a web dashboard program which keeps track of your measurements over time, showing you clearly exactly when your weight has gone up or down. The precise tracking allows you to see how factors such as stress and many of the other elements of modern living affect your weight from day to day. The first thing that strikes you about the Connected scale is that the design is pretty slick: soft lines and a dark, metallic colour scheme seem to have been drawn from the iPhone school of design. The ‘retro’ digital readout is large and easy to read and fits the look quite well. It turns on and off automatically and features an instant ‘weigh in’ whenever you stand on the scales. It’s also remarkably thin, being only twenty-three millimetres in depth, even with the four carpet feet attached. The device is powered by 4 AAA batteries (included with the package) and it includes free access to the web dashboard programme. All in all, for something that you stand on, it is a pretty attractive piece of kit. 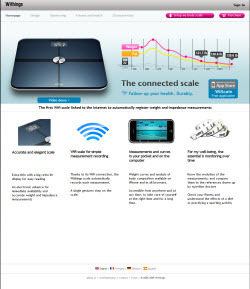 This idea of using a WiFi connection to measure your weight is quite a good one. Considering that your weight can change depending on what time of day it is, having a nicely graphed progress report is likely to be far more informative than simply standing on a set of scales in the morning. 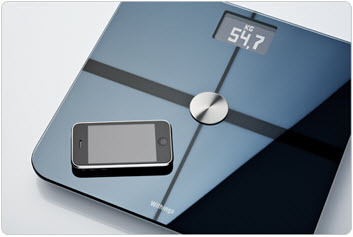 The Connected scales also measures your fat mass, lean mass and body mass index, so you’ll get a good idea as to what is going on. It also features automatic user recognition, so you can have different profiles for each person in the house. All of this is automatically sent to the web dashboard programme, which you access via the Internet, or from a specially created iPhone application. The dashboard itself is clear (both on the website and iphone app) and, as with the scale, looks pretty cool too. 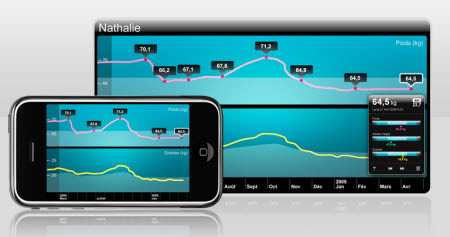 Since the scale is incredibly accurate itself, Withings say that the dashboard measurements are perfectly accurate and from these measurements, the system calculates your BMI and also offers you a ‘reference’ guide – a comparison of your figures to the statistics of the ‘ideal’ numbers of a healthy person of your age, height and gender. (They do of course specify that this reference point is an estimate and should not be taken as an absolute ideal.) It will also keep track of your ‘body curves’- your weight rising and falling over time. This is particularly important in the context of the so-called ‘yoyo effect’ – a possible side effect of the stresses of modern living and diet, whereby your weight continuously fluctuates. Access to the dashboard is by password, just in case you are a little embarrassed by the results and want to keep them private and it is possible to have multiple profiles if the Connected scale is to be used by more than one person. So, now that we have established what the Connected bathroom scale does, it rather begs the question- why do we need all this? One of the most common health problems in modern Britain is obesity which, along with widespread poor nutrition, is on the increase. As all doctors will tell you, prevention is the easiest way to avoid the associated health risks with being over or under weight. Monitoring your progress in terms of not only weight, but also body fat and lean mass and on such a detailed scale, should tell you very quickly if you are doing something that is heading towards the slippery slope to obesity. Certainly, if you are on a diet and trying to loose weight, then being able to see your progress over time is a great way of encouraging yourself to keep going. Pictured left : The withings website is easy to use and provides a innovative dashboard. I own this scale and I measured myself several times, every 30 seconds, and weight variation is 1kg and fat variation is 2%. I’m not sure if this is what you mean by accurate but for me it’s not accurate. According to scale my fat is 17% to 19% and wight is 74 or 75 kg.